Gone Girl, the newest picture from David Fincher, embodies almost perfectly what subject matter the much acclaimed director likes grappling with in his films. This being, odd relationships. An aspect which is quite evident whether looking at it from a conventional angle in the chilling 1995 picture, Se7en, which showcased a rocky relationship between two detectives. Even recent pictures like Curious Case of Benjamin Button and The Social Network work in this mould. The former depicting a metaphysically tragic relationship and the latter, an eroding and bitter relationship that was not quite healthy to begin with. Gone Girl, builds itself as a very intriguing mystery, that quickly proves to not only be a true red herring, but just the catalyst for something far more sinister and disturbing. This new development of the picture is quite timely, given the recent resurgence of the Madeleine Mccann case here in the UK. The plot development as well as the thematic implications that it carried proved to be a welcome relief. As I felt that Fincher for the first time in one of his films was being quite manipulative in his direction. Needlessly stretching the audience into believing one opinion on the events depicted to the point of tedium. The screenplay, penned by the novelist of the book of the same name, Gillian Flynn cleverly creates two seamless narrative streams. At first, they illustrate past and current day, and finally feel like a reality television show that is being shown in real time. Amy Elliot Dunn proves to be the screenplay`s central fascination, not only in terms of lines provided, which crackle with tantalising venom, but also in terms of character depth. There is a tragic irony to Amy because she holds such a resentment of the “Amazing Amy” persona that she is trying to live outside of it. This is evident with a telling line near the beginning when she says “Amazing Amy is always one step ahead of me.” However, with all the events in the picture, she is almost trying to carve out an identity that plays on “Amazing Amy.” and yet feels entirely separate. Is Amy just trying to create this image because she has been raised like that and did not want it to end, or is it just her way of affirming a true sense of control? These ideas along with implications of what these events do for marriage and commitment make this one of the richest screenplays that Fincher has ever directed. It is Ben Affleck who proves to be the most fascinating to watch, his all-American charm, and down to earth traits are harnessed quite sharply by Fincher. These qualities are nicely moulded into a protagonist that has more going on than what is initially perceived. A fact that is played with throughout the picture, and its a credit to Affleck for being able to subtly play all these sides exceedingly well. 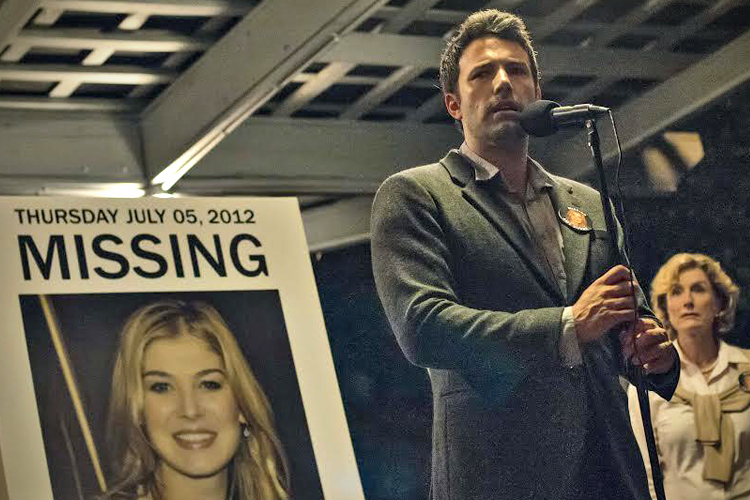 Finally, Gone Girl marks the third collaboration between David Fincher and composers, Trent Reznor and Atticus Ross. The score proves to be their best effort to date, with some warm and classical motifs fused with their usual mix of chilly, bleak and sometimes downright frightening experimental work. It is the final and important ingredient that makes Fincher`s depiction of marriage, control and perception a rousing success.